Back in August, I caught an RT by Max Temkin, which announced his participation in a gaming conference called TableFlip. It was going to be in San Francisco, so we were in. Then the tickets went on sale, and we wavered a bit. A few DMs later, we decided to buy one ticket, and Michele would volunteer for her attendance. We started off day one of the conference with a brief introduction by TableFlip founders Tim Hwang and Patrick Ewing, and then the first speaker was David Malki ! His presentation focused on theme and game mechanics, primarily drawing from his own experience creating the card game Machine of Death, inspired by the book series he co-edits, which in turn was inspired by a Dinosaur Comic by Ryan North. At one point to illustrate the impact of emotions on the game play, he gave fake game title/description combinations “found on Boardgamegeek”: Poltergeist Heist was the most popular choice of four fake game title/descriptions, which involved ghosts haunting houses and robbing them without getting caught. Others included Angels of the Minefield, Checker Soccer and Wizards and Wilbur, which all got less votes because they kinda made other players feel bad. After the presentation we played the classic abstract game War, where the rules are simple and your goal is to have a higher value card than your opponent and collect all of the cards. Round 1 was playing it straight. Round 2 had opponents role playing as generals leading a war, and someone said they started feeling sorry for the lower numbers. Round 3 was a different form of role play where opponents were leading ant colonies to steal food from a picnic, which seemed like a fun theme, but then ended up too much like the original, and the value of food varied between people. Then we did an exercise where each table changed one game mechanic of War of their choice and made up a theme. Our mechanic change was to build out our decks at the start of the game after dividing into two small decks based on the color of the cards. Our theme was AIs competing for resources to learn more advanced skills. Other tables had law firm, frat party, mafia family, food delivery startup and dividing up the loot after a Poltergeist Heist themes. There was even a game themed around Gone Girl. Overall it was a fun exercise, and the forty minutes or so of playing different variations of War worked out as a pretty good learning exercise. I also used TableFlip as a good place to playtest my own Ingress: The Relic prototype board game. In the submission phase, have a more helpful guide on where the good spots are to place tiles. Possibly use an F card for adding another portal spot to the board. Once a control field is established it should remain on the board and not be able to be destroyed. An F card removing a fully built up tile can be demoralizing to the player that took the time to build. It seems easier to destroy than build. Action deck with 1, 2 and F seems well balanced. After an extended lunch break of playtesting and Z Pizza, we came back to a presentation about Counterinsurgency games based on history. Volko Ruhnke and Brian Train presented two games. First, a Vietnam multiplayer game (Fire in the Lake). All previous board war Vietnam games were single player or two player. Second was an Afghanistan game (A Distant Plain). Both Vietnam and Afghanistan games have local counterinsurgent faction, foreign counterinsurgent faction, local majority insurgent faction and local minority insurgent faction. Most war games have kinetic content, where you use power and strategy for conflict. For counterinsurgency games, it involves more political and psychological tactics. They have nonlinear effects vs the fairly linear kinetic operations of a standard war game. Terror operations in the Afghanistan game can sabotage the economy of the country which makes it harder for the counterinsurgents to respond in conflict. Randomness is introduced from event cards not dice. Small changes from event cards early in the game can have dramatic effects later in the game. Friction is in an example established between allied factions who have to manage a joint bank account of resources. After the presentation, I participated in a play test of Fire in the Lake. It was awesome because Volko ended up being the assistant at our table, so we learned the game from the man who designed it. I liked that this war game used politics as a core game mechanic. Playing as the nation versus as a general makes the game far more appealing than a general vs general war battle simulation. The game board and piece design was super well put together. I want to steal the numbers for scoring on the side of the board for my game. After the play session, Volko and Brian did an extended post mortem/Q&A. There was some personal discussion about the implications of making a war game for entertainment. It was clear that a lot of the attendees were there to see Volko. I wasn’t interested in his game so much, but the design was outstanding, and he was a very nice person to talk with. We took a break for dinner. My wife and I had burgers, fries and a Coolhaus ice cream sandwich at Umami Burger, which lived up to the hype. After dinner we headed back for prototype game free play. I was going to set up my game, but another game caught my eye and had seats available so we decided to play it instead. Scoundrels, a pirate game, was the only other prototype I had the ability to play in the evening. It had action cards to propel your pirate ship from port to port and dock to bury the loot you pillage. I ended up the ghost pirate after being the first killed. In the end I also caused the endgame scenario. The creator had a true tableflip moment when he was pretty sure he’d be able to steal treasure and get more infamy, but didn’t wager enough points to do so, losing by a point. The game was well put together after two and a half years of development, and I will look for it on Kickstarter in the next few months. We didn’t actually flip any tables, since the location, Apportable, had given us use of their sturdy, regular furniture. The CEO, whom we found out was lurking for the whole first day, did say we could stay as long as we wanted, and could burn the place down, for all he cared. Day two began with Max Temkin, who had submitted a required presentation title as one that focused on the virtual collectible card game Hearthstone, but his actual presentation had nothing to do with Hearthstone. Max tied the philosophical studies of Wittgenstein in with how people socialize, touching on the current atmosphere in the gaming community, Humans vs Zombies, Cards Against Humanity, Johann Sebastian Joust and the internet. One standout quote that seems to be true was a definition of fun that said that in order to have fun you have to introduce some combination of one or more of the following: pain, nausea and confusion. It was a heady conversation which lead in to a game which has been ongoing in CAH’s office, called Havapeyma (airplane). To start, you lock pinkies then break them up to get in for the game. If another player hands you something you have to say “I remember,” and if not and the other person says “you forgot,” then you are out of the game. The game can last for years. Next (and tied into Havapeyma by its nature) was a rousing game of Spaghetti Showdown, which has groups of two holding a piece of spaghetti between them and trying to keep the piece unbroken. The last two people with a piece of unbroken spaghetti between them won. Max also brought Peter Coddle’s Trip to New York, a late 19th century fill in the blank game similar to Mad Libs or Cards Against Humanity, where you told Peter Coddle’s tale by using small slips of paper with nonsensical words or phrases on them to fill in the blanks in a story book. Ghost Blitz, where you’re a color blind ghost, and players had to be the first to pick up the two objects on a card, and the colors of the objects don’t match what’s on the card, so you might grab the wrong thing. We also played Hamsterolle, a game like Jenga, but on a wheel instead of a tower. We played some Slap .45, which we’d previously played at GX2. It was mildly painful and somewhat confusing but I felt no nausea. When the round was over, a new one started, and we started more free play time with another play test. 2 player game removing portal submission phase and portal permadeath. Players kept redeploying same small area. Full cards came up on occasion and it became more about the action cards and how they fell than the pieces on the board. Tried oddly shaped beads, pony beads are better. Suggestion would be to reduce playing field for two player game. Felt a lot like Ingress in real life. After that playtest, we took a lunch break and many conference attendees ended up at farmerbrown’s Little Skillet, which had been recommended in the conference program. The restaurant that expanded into the space which was formerly 330 Ritch has changed a lot from being just a little window for ordering. The food is still top notch southern style cooking. We had chicken wings and drumettes with mini-waffles, lemonade, and my wife had a side of macaroni and cheese. They didn’t seem to have red velvet cupcakes available. Upon our return, Matt Leacock did a presentation about player autonomy, or attempts to give players autonomy, in his cooperative game Forbidden Desert. After a short discussion, he asked that we experiment with a new play mechanic that would allow the game to continue if a number of players died in the game, to see if it changed the game in any way. There was definite emotional trauma when water ran low, thematically amplified by the hot warehouse we were in. My table pulled through in the end, and got out of the desert all together. It was a fun game to play once, but not one I’d run out to buy. We had time for another playtest of my game after finishing up our Forbidden Desert play session. Three player game with pony beads, much more fun and fluid with removed portal submission. Suggested potential make it harder to destroy portals that are surrounded by portals of the same color. Matt did a short post mortem on our experimental mechanics in Forbidden Desert, and Tim and Patrick closed out the conference, including a plug for Malki !’s stuff, a plug for a local East Bay playtesting group, wresting a Hearthstone tip out of Max, and Malki ! making up a quick way to get Poltergeist Heist. After another round of Spaghetti Showdown, the conference ended, but people stayed and played games. Max tried to install Fibbage on Apportable’s PS3, but the internet wasn’t cooperating. We headed to Noodles for dinner, and went home. It was a great conference. I learned a ton about game design, theme, and mechanics, and I feel I am ready to start building a print and play copy of my prototype. My game has gotten much better thanks to the suggestions of Teale, Paolo, Raph, Randy, my wife, a friend and some local Ingress agents. After just six play test sessions, I’ve worked out a ton of bugs, and am extremely happy with how it has turned out. The conference had a lot to offer, and the content was well worth the somewhat premium cost. I’m hoping there’s another one in the future, and will likely attend. To read about some other games at the con, check out this writeup by Kara, and this one by Malki ! You can see all of our photos on Flickr. 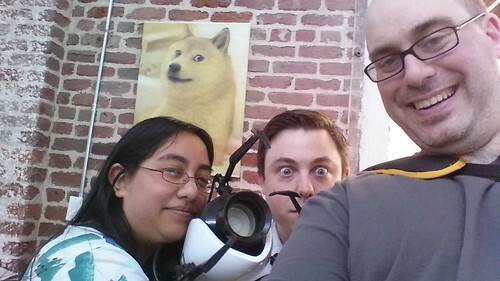 October 6, 2014 in Event, Games, Nerddom.